Download Hello English: Learn English APK v787. With this app, users from across the world will be able to learn the Spoken English and Grammar from the languages of their choosing like Hindi, Indonesian, Thai, Arabic, Malay, Urdu, Malay, Bangladeshi, Bengali, Punjabi, Telugu, Tamil, Kannada, Marathi, Gujarati, Oriya, Assamese, Malayalam, Chinese, Portuguese, Turkish, Nepali. This is a free English learning course app that has been used by over 24 million users from all across the globe for the purpose of learning spoken English, grammar and vocabulary building. The app has been ranked as no. 1 Educational App by google. It is undoubtedly one of the best apps out there to learn spoken English free of cost. Offers 475 Interactive lessons. The interactive lessons are 100 percent fee to use for the purposes of conversational English, grammar topics, vocabulary and much more. All of the lessons are accessible even when offline. 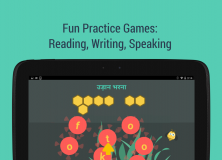 Offers learning by Interactive games. The interactive games allow users to learn the reading, translations, spellings, grammar and vocabulary in a gaming style. Allows discussions with teachers. You can now ask questions from teachers about grammars and translations. Practice is carried out by daily news. Learning is made efficient with help from latest news, articles, audio-video clips and e-books. The app allows users to hold daily use conversation by speaking directly into the app. This allows you to massively improve your English learning capabilities. The app comes with 10,000 words dictionary. Learn a new word daily along with its meaning and pronunciation. Allows you to keep track of your rank. With the app you will be aware of your global and city rank. What's new in this version of Hello English? Challenge and Play with other learners on Hello English now!